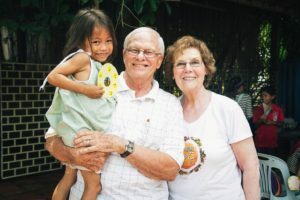 After just a couple of weeks returning with her husband Andy for their second time in Cambodia, our beloved Norma Dodson was diagnosed with ovarian cancer. She battled for almost a year and although her mind and soul desired earth, her soul won the battle for eternity and she went to be with Jesus on Saturday, August 5th. From an earthly perspective, we are weeping for the loss of our time with her, as she was a beautiful, kind, and loving woman. But, from a Heavenly perspective, we are confident she has been completely healed and is now wrapped in the arms of Jesus. Norma’s very presence embodied the love of Christ, serving those around her with the gentleness and compassion only she could bring. 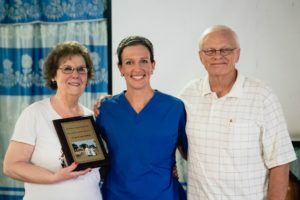 We laugh thinking back to the time she first engaged with Tiffany Atkinson (Executive Director), insuring her that “I will never go to Cambodia.” The call of the Lord was stronger than her own plans and her submission to His will won out! 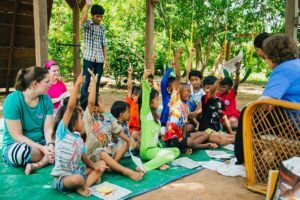 She committed the last several years of her life to advocating for the children of Cambodia on behalf of Freedom’s Promise; from her efforts, there are now two school libraries, increased number of teachers, and countless children’s books in homes across the nation. A passionate educator, Norma had the unique ability to capture the attention of even the most rambunctious children. She truly had a gift for instilling an excitement for learning in children, inspiring them to dream and follow their passions. 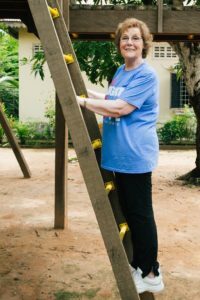 On her most recent trip to Cambodia last September, the heat couldn’t contain her excitement for being able to return. On any given day, you could find her with a book, a game, or coloring books and a circle of children. When asked to take a break and rest during the long days of ministry, her sidelong glance let us know she was not to be hovered over and would not be talked into leaving her story time. If you knew Norma, you have most likely heard about “the Dot”. 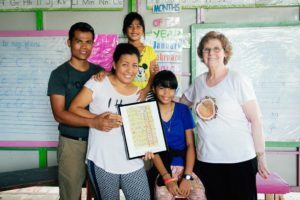 These “Dots” can be found in learning centers across the nation of Cambodia, where she surely made her mark in the lives of many. 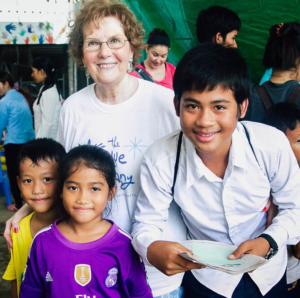 To Norma, we love you deeply and will honor your memory with our continued efforts to educate children in Cambodia. It was truly our joy to work alongside you to serve the Kingdom and we will cherish you always. Please pray for our dear Board Member, Andy and family, as they learn to navigate life without her presence. Join our mailing list to receive the latest news and updates from Freedom's Promise.